The possibility of quickly following up on new discoveries allowed astronomers from the Wise Observatory to perform one of the first spectroscopic observations of an exploding star in the galaxy NGC 628=M74. The galaxy, compiled by the French astronomer Messier in his 18th century catalog, is located some 30 million light-years away from us. The light of the exploding star left the galaxy when only the earliest primates existed on Earth and reached our telescopes on 29 January 2002. Exploding stars are dubbed "supernovae" and are thought to occur when the core of a massive star implodes into a compact object (neutron star or black hole). The envelope is ejected with about 1-10% of the velocity of light. The explosion in M74 was first detected by a Japanese team of amateur astronomers and by an American team led by W. Li from the University of California at Berkeley. By astronomical convention, the exploding star was named SN 2002ap. Its study promises to reveal one of the brightest supernova explosions observed in the last decades. 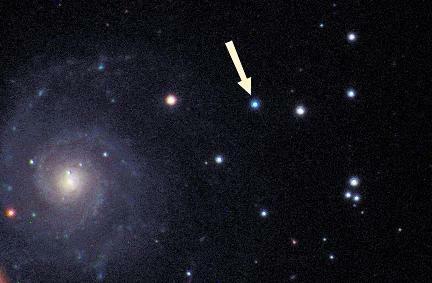 The discovery observations just revealed the presence of a "new" object on top of the image of the galaxy, on the outermost part of its spiral arms, whose light kept increasing after the discovery. Within two days, the new star brightened by more than a factor of two and the brightening process had not yet stopped. In order to understand the nature of the exploding object whose characteristics change quickly there is need for rapid spectroscopic observations, which analyze the light by colors (wavelengths). Immediately responding to the discovery reports, the Wise Observatory supernova group launched an observational campaign to follow this new and exciting target. 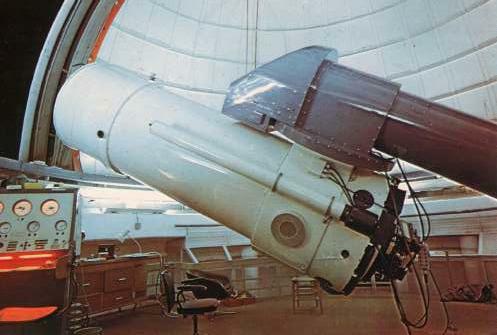 The regular observation programs were interrupted and the FOSC spectrograph, an instrument designed to carefully analyze the light from faint sources, was mounted on the Wise Observatory 1m telescope located near the town of Mizpe Ramon, in the Israeli Negev desert. The first spectra were obtained on January 31, one day after the explosion was announced to the world. The observations collected by Mr. John Dann were transmitted electronically to the Ramat Aviv campus of Tel Aviv University , and were analyzed immediately by Avishay Gal-Yam and Ohad Shemmer, Ph.D. students in Astrophysics . 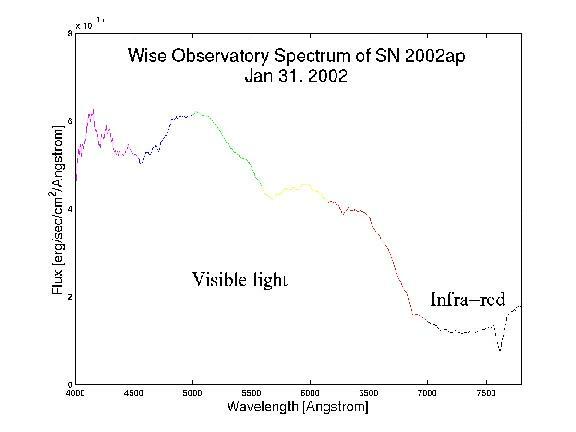 To the surprise of the Wise Observatory astronomers, the spectrum of SN 2002ap resembled that of a very rare type of supernova, of which only two previous cases were reported. These rare events, dubbed "Hypernova explosions", are among the most energetic explosions known to mankind and may be related to the mysterious "gamma-ray bursts" (GRBs). The nature of gamma-ray bursts, first detected by satellites designed to monitor nuclear weapon tests in space during the cold war, is one of the "hottest" open questions in current astrophysics. The possible relation between "hypernovae" and gamma-ray bursts is believed by many to be one of the best clues available to solve the gamma-ray puzzle. If supernova 2002ap is indeed a hypernova, it could become visible with small telescopes by February 18 or even before. A hypernova may be the end result of the evolution of a very massive star, perhaps 40 times or more massive than our Sun. The findings of the Israeli team were confirmed by two other teams, from Japan and Europe, and the reports of the three groups have been announced in a telegram issued by the International Astronomical Union on Jan. 31. 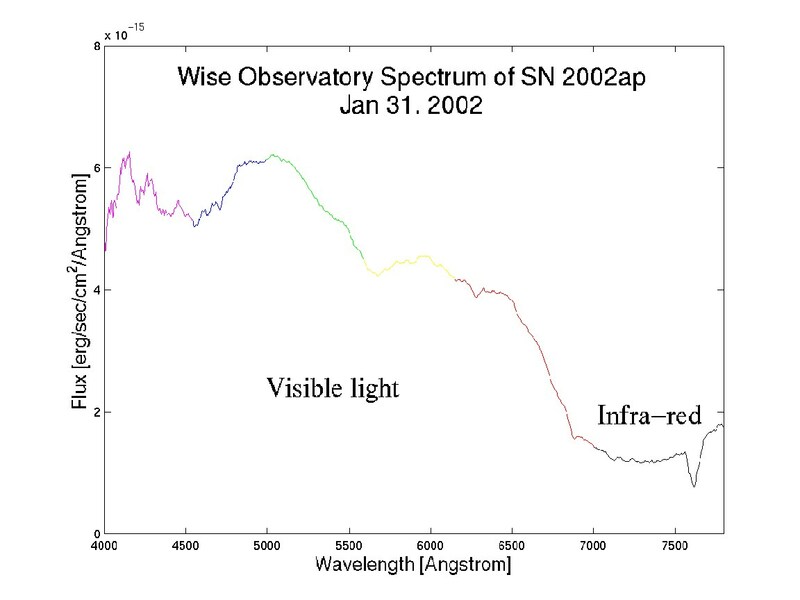 Subsequently, observations of SN 2002ap were undertaken by teams from around the world, monitoring this supernova in ultra-violet, visible and infra-red light, as well as at radio frequencies. The Wise Observatory SN group will continue to monitor this supernova that promise to become one of the most interesting astronomical events of this year, using multi-color digital images and spectra from the Wise Observatory instruments. Prompt, on-line reaction to unexpected astronomical events, flexible scheduling, a high level of automation and the large number of clear nights, even in the middle of winter, have combined to make the Wise Observatory highly competitive with other astronomical facilities world-wide, as these new and exciting results prove. Color image created with data from the Wise Observatory. The possible hypernova is the bluish image marked with an arrow right of the center of the image. The M74 galaxy is on the left side of the image. The galaxy is of type Sc, somewhat similar to our own Milky Way, with vigorous star formation taking place in its spiral arms. It also has an unusually extended disk of neutral hydrogen, twice as large as its stellar disk. Spectrum of the possible hypernova obtained at the Wise Observatory. The various portions of the spectrum have been colored according to the different spectral bands, from the violet-blue at left to the red and infrared at right. The features are probably spectral lines, widened by an expansion at 10% of thespeed of light. These two images have been prepared by Eran Ofek, Keren Sharon, and Oded Sharon, all graduate students at the Department of Astronomy and Astrophysics of Tel Aviv University.